I have a big jar of it on my nightstand and smaller tubes that I buy for my bag, my desk drawer in the office and my coat pocket. For some reason, many drugstores put it in the baby section. It’s certainly good on babies’ bottoms, but I also recommend it for patients of all ages. 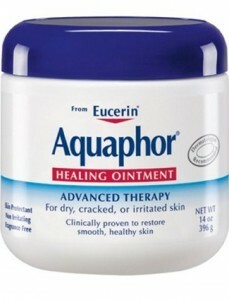 In many ways, Aquaphor ($14.99, Walgreens.com) is the ideal product: It’s very inexpensive, and it works really well. In winter, slather it on damp skin to lock the moisture in and on lips before going out; in summer, use it over scratches and cuts to keep the skin moist and promote healing.